Sweets and the Sunshine State are a match made in heaven. Centuries ago, native Floridians used honey to sweeten dishes, as well as prickly pears and other wild fruits and berries. Spanish explorers introduced citrus to the area, leading to a major industry. Florida pioneers planted sugar cane and sweet potatoes as basic crops. Cane grinding, taffy pulls and homemade ice cream socials were once beloved community events across the state. The state pie of Florida, the Key lime pie, has been an addition to family affairs and restaurant menus since its inception in the late 1800s. From strawberry festivals to Florida flan, author Joy Sheffield Harris uncovers the state's unique sweets with a taste of sunshine. Joy Sheffield Harris was born in Tripoli, Libya, on Wheelus Field Air Base and then moved to Florida just in time to attend Humpty Dumpty Kindergarten and later Florida State University. She went on to become a home economics and history teacher at her alma mater, Rutherford High School, in Panama City and a marketing specialist for the State of Florida. Joy met her husband, Jack, while promoting Florida's natural bounty on television in the early '80s. After they were married, they briefly owned a restaurant with friends called Harris and Company, and in 2010, they co-wrote Easy Breezy Florida Cooking. Their son, Jackson, works in the aviation industry, and when he comes to visit, they all enjoy traveling throughout the state of Florida. 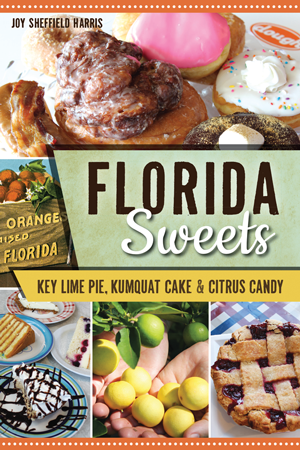 In 2014, Joy wrote A Culinary History of Florida, and she continues her studies of Florida food with Florida Sweets.